Cotton clothing, unless blended with a synthetic fiber such as polyester, wrinkles easily or becomes crumpled during the washing and drying process. While ironing is considered a chore by many people, it is the best way to get the wrinkles out of cotton. Always read the label on cotton clothing to insure you are using the correct setting on the iron. The use of starch, when ironing cotton, is optional. Set up your ironing board in an area where you will have access to an electrical outlet. Plug in the iron and set it to the cotton setting. 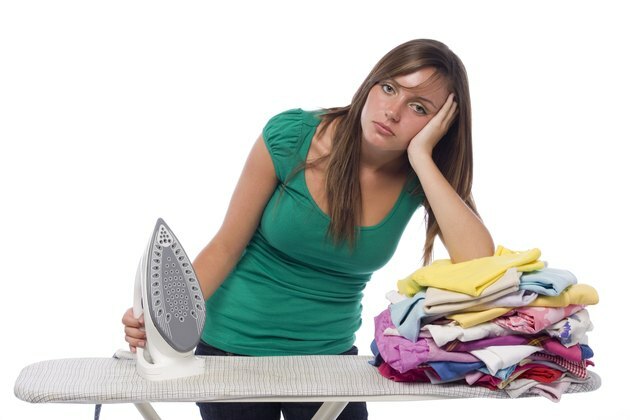 Fill the iron with distilled water if you plan to use steam, which helps pull the wrinkles out faster. Turn the clothing inside out. This will keep the heat of the iron from removing any finish on the cotton. Spray the item with spray starch if you want the crispness that starch brings to the fabric. Place the item on the ironing board and iron out the winkles a section at a time. If ironing shirts, begin with the collar. Try to position the garment so you are only ironing one layer of cotton fabric at a time, although for some items, such as pants, this is not possible. If you do not have a steam iron, fill a spray bottle with distilled water and spray the cotton lightly with water as you iron each section of the garment. What Is a Cotton Press Cloth?